Stipe Miocic gets his shot at UFC gold, but on short notice. When we’re lucky, there are silver linings to bad situations. Former UFC heavyweight champion Cain Velasquez pulling out of his rematch against title-holder Fabricio Werdum at UFC 196 on Feb. 6 stinks. However, we’ve still got a heavyweight championship bout, with Stipe Miocic stepping in against Werdum and that is a compelling contest. Here’s our take on the good and the bad of Miocic filling in for Velasquez, and a quick look at the new big-man title fight on SuperBowl weekend. Velasquez is one of the very best fighters in mixed martial arts history, and he has the resume to show for it. The well-rounded former All-American college wrestler has two reigns as UFC heavyweight champion, on the strength of his well-rounded skills and unbelievable will and conditioning. However, nearly 10 years into his pro MMA career, and at 33 years of age, Velasquez is spending more and more time on the sidelines due to serious injuries. More than likely, there’s no one to blame. Fighting is the hurt business, and you don’t do it without getting hurt, no matter how you train and fight. Eventually, serious injuries and multiple surgeries usually have an effect on the performances of athletes. We have our fingers crossed that won’t happen quite yet for Cain, because it’s a lot of fun watching and learning from his fights. The truth is that the Ohio firefighter deserved his shot at the world title long before his KO of Andrei Arlovski last month. He deserved it before he beat Mark Hunt badly before that. Heck, Miocic deserved ths shot ever since he deserved the win over Junior Dos Santos back in 2014. There was no controversy in Fabricio Werdum’s win over Cain Velasquez last year, and so there was no particular reason for them to have an immediate rematch. It should have been Stipe in there all along, so in that sense, we’re glad it finally is. 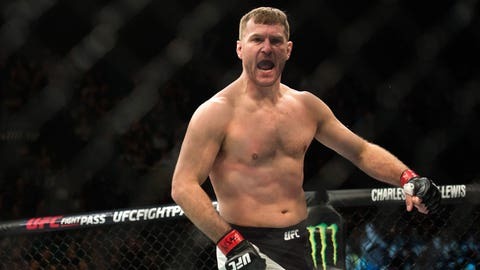 While we’re certain Miocic is thrilled to finally get the title shot he’s long campaigned for, we can only imagine that he wishes he could have gotten some rest since his last training camp and fight, as well as a full camp to prepare for the heavyweight champion of the world. For his part, Werdum probably considers himself adequately prepared for anyone in the world after training for Cain Velasquez three straight times, but it is never easy changing tactics and strategy for a new opponent on short notice. This will be the second time in his last three fights that Werdum has had an opponent change at the last minute because of a Velasquez injury, and though he may be getting good at it, such short notice isn’t really fair to either him or his challenger. If Miocic and Werdum are anywhere near ready to face one another, this is an interesting fight, stylistically. Though the champ with a full camp has to be considered the favorite, Miocic at his best, could match up well against him in spots. To be sure, Werdum stands a very good chance of submitting Miocic if they end up on the ground, especially if the Brazilian lands on top. However, on their feet, the fight is a toss-up. Miocic has excellent boxing, both with his hands and feet, and is capable of putting out record volume with strikes. He also has the natural size and height to stand up with the tall Werdum. Werdum exploited his height advantage well in the clinch against Velasquez, using big knees from the Thai plum to do major damage. Miocic is a natural heavyweight, the way Werdum is, and might do better in close than Velasquez did. Werdum’s outside striking is rangy, sometimes hard to predict and comes with good timing. We can no longer understimate his stand-up striking skills. There is a good chance that this fight could be contested mostly on the feet. It is anyone’s fight there. The difference could be takedowns. Werdum should want to eventually see if he can get Miocic to the ground. It will be hard, however, because of the challenger’s underrated wrestling.